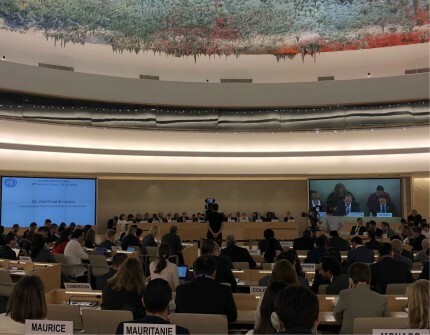 On June 25, 2018, the UN Human Rights Council (UNHCR), at the 38th session held in Geneva, Switzerland, adopted the Joint Statement on encouraging the protection of cultural heritage along the Great Silk Road with a view to promote universal respect for cultural rights. The following 24 states along with Turkmenistan became the co-sponsors of this Joint Statement: Afghanistan, Albania, Armenia, Bangladesh, Belarus, Georgia, the Islamic Republic of Iran, Kazakhstan, Cambodia, Canada, China, the Democratic People's Republic of Korea, the Kyrgyz Republic, Mali, Maldives, Mongolia, Pakistan, Russian Federation, San Marino, Syrian Arab Republic, Sudan, Tajikistan and Uzbekistan. By their declaration, the UN member states recognized the protection of cultural heritage along the Great Silk Road as an important component of the promotion and protection of human rights, including the right of everyone to participate in cultural life, the ability to access and enjoy cultural heritage. Respect was expressed for the diversity of cultures, tolerance, dialogue and cooperation, which in a climate of mutual trust and understanding may contribute to the upholding of international peace and security and promoting friendly relations among nations. The document also indicates that the Great Silk Road as an ancient network connecting cultural interaction between East and West revitalizes cultural heritage of the region. The Great Silk Road played a significant role in the development of the civilizations of countries, laying along this historical route, opening far-sighted political, economic and cultural relations between the civilizations. The important role of the UN Special Rapporteur in the field of cultural rights in global efforts to protect cultural heritage was noted with a view to promote universal respect for cultural rights and to dialogue, peace and friendly relations among nations. Countries welcomed the work done on identification of innovative ways and good practices, at the national, regional and international levels, for the prevention of violations and abuses of cultural rights and called on States to adopt and improve existing effective mechanisms to prevent the destruction of cultural heritage. Within the framework of the above, at the initiative of the Government of Turkmenistan it was proposed to organize a number of thematic side-events in Geneva as preparatory meetings aiming to complement mentioned workshop on cultural rights and to pay special attention to the protection of cultural heritage along the Great Silk Road.